We provide professional quality refurbishment at discount prices, often beating list price by 80%. 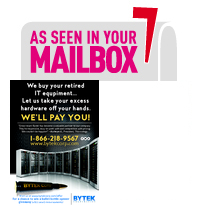 Bytek will solve your most difficult Storage issues, and will even pay cash to get your old systems off your hands! Bytek saves you over 80% off list price for refurbished routers and switches, from Cisco, Foundy, Brocade,more. Bytek can save you over 80% off list price for refurbished IP phones and systems, from Avaya, Nortel and more. The center of the SPARC station 10SX is concentrated in a main system unit. The SPARCstation 10SX system contains many useful parts, such as a Main Logic Board (MLB) to store data. A MBus modules (up to 2 modules) for storage. The SPARC station 10SX also contains a DSIMMs (32 to 512 Mbytes) and a SBus cards (up to 4 cards). The SPARC station 10SX has demetions of Internal 3 1/2-inch (88.9 mm) hard disk drive units (up to 2 units) and Internal 3 1/2-inch (88.9 mm) diskette drive unit. And lastly, the SPARC station 10SX comes with a 140W power supply containing 3 working fans.